On most occasions, you cannot travel with your conventional shaver. Having to constantly pack the cable and charging station especially when you are on-the-go can be a challenging task. You risk leaving at least one component in the house thus rendering your shaver useless. When you are traveling, maintaining a clean shave can be challenging. Sometimes we often get ourselves in situations where we have to show for work but our beards are not in the best of appearances. Suppose you were going for a job interview for a corporate position and you show up in the waiting room only to find your fellow interviewees are well groomed. This can be a mood killer and the chances that you won’t make it past the interview are high. A well-groomed face increases self-confidence since you already know that you are looking great for any job. Electric shavers can be used on different body areas i.e. armpits, beards and even shaving unwanted body fur. You should invest in an electric shaver because it will not only save you space but also makes it convenient to get your job done. For a very long time, I never thought that it was necessary to have a portable electric shaver. Normally a conventional electric shaver would work perfectly for me. Let us just say that my previous job did involve me traveling a lot. The day I missed a flight because I took too much time trimming my beards, was the day I changed my perception of electric shavers. If only I had one, I could have shaved my beard after I arrived at my destination. I could have even done it at the airport’s washrooms and walk out looking flashy for my job. Almost everyone needs an electric shaver for various reasons. Travel electric shavers are small making them ideal for compact packing and don’t require extra accessories like a power cable and a power supply source to run. This comes handy especially for people who use air travel a lot. A small yet useful shaver gives you extra space for you to pack other accessories that you need. It also reduces your overall load so you won’t have to pay for extra weight. They use batteries ensuring that you always have a clean cut wherever anywhere. Some of these devices run on lithium batteries that are charged using an external docking point. Others use AA or AAA batteries that are disposed of immediately they run out. The chart below is a summary of the various features that these travel shavers have. It will give you an idea of how your shaver matches with others. In most cases, you will easily find a cheaper travel electric shaver that will easily get the job done. But not all will give you that quality shave that will match your outfit. This shaver might also not perform well in terms of power consumption. There are some shavers that use a lot of power but still don’t get the job done. Braun is a well-known brand. It is widely known for making arguably the best portable travel shavers that you can find on the market. The M-90 model lives up to the expectations of many users. This is an efficient shaver that will give you a smooth close shave while still having exceptional reliability and improved performance. The shaver is designed with what most people commonly refer to as a SmartFoil technology. This technology comes in handy specifically for people who have hair growing in different directions. It works to allow the blade to capture hairs even though they are growing in different directions. This means that you will be able to reach your sideburns, mustaches or any body hair. This awesome product has an ergonomic hand extension for an improved grip to ensure that you have an effortless shave. Maintaining this shaver is easy. You can wash it under running water to remove any hair that is trapped and it has a twist cap for protecting the foil when you are not using the shaver. The cap allows you to store the shaver in compact places without running the risk of damaging your blades. It is powered by replaceable batteries offering up to 60 minutes of runtime before they run out. There is a precision slide out trimmer. This makes it easy to shave longer. Fully washable under water for easy cleaning. Has a cap to protect your blade against damage. Clean shave for hair growing in different directions. It uses 2AA batteries that tend to be costly when replacing. No plug is required hence cannot be used by plugging it into a direct power source outlet. The foil has durability issues. Philips is a widely known company that makes a wide range of electronic products. For many years the company has grown its reputation to make it among the most reliable when it comes to manufacturing different electronic gadget. Most of their products are loved for their unique great designs and reliable performance. 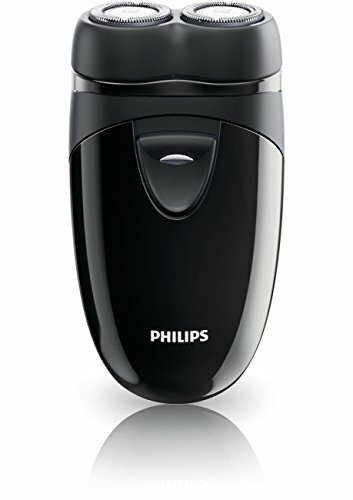 This Philips Norelco PQ208/40 is an awesome product that I can recommend for anyone who wants to have that on-the-go shaving experience. This is a high-end product whose cost will easily fit into your budget. If you are looking for a good portable travel shaver that will give you a close, dry shave on different sizes of hair then this Norelco PQ208/40 will be the excellent choice. The product has a CloseCut system. This feature allows it to give a close shave that will not leave your skin itchy or irritated. Its independently floating heads gives you precision cuts since this feature allows the blade to closely follow your skin curvature ensuring that you get a clean even shave. This shaver uses 2AA batteries so you don’t have to worry about bringing your charger or power adapter whenever you are traveling. The blades have been designed allowing them to self-sharpen and can last up to two years. This means that if you are a frequent traveler, changing blades or losing the quality of the shave is the least of your worries. For the convenience of storage, this shaver has a pouch for safely carrying and storing your shaver. – It costs less than $20 making among the cheapest. Battery operated for ease of use anywhere. It has a travel pouch for storing and a protective cap for keeping unwanted elements from the blade head. Its self-sharpening blades is an outstanding feature that distinguishes it from other travel shavers on the market. You will only get a 60-minute shave before the 2AA batteries run out. There might need to replace the blade since the self-sharpening feature does not work as expected. The shaver has a smaller surface area hence can increase the shaving time. 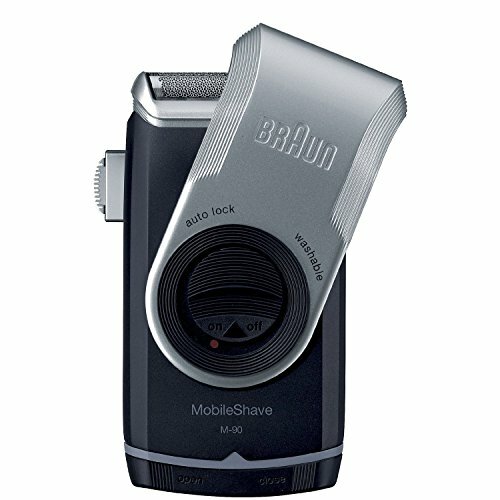 At first sight, you might easily confuse this Panasonic shaver to the Braun one since they look alike in design. However, when it comes to other features and performance, they are totally two different gadgets. My personal preference for a good shaver is that it should have a single floating blade. I just find such blades less irritating during and after shaving. This product lives up to my expectation and probably will meet most of your expectations thanks to its single floating blade. It has a single floating blade and a more robust motor than most of the other popular models on the market. This motor allows it to deliver a good even shave. I always love to feel comfortable when handling any product. This shaver has an ergonomic handle that allows me to have a firm grip of the device. A good grip means that I am always in control and I will avoid any shaving mishaps. This travel shaver runs on 2AA batteries that you can easily replace after they wear out. This is a bona fide wet/dry shave hence can be used in the shower or for both gel and wet shaves. It will clean under the faucet without leaving any muss. This shaver is small enough hence can fit in compact spaces making it ideal for traveling. This product weighs 5.4 ounces and has a blade cover to ensure that your blades are well protected. Its Lightweight design means that you can easily carry it anywhere. It has string motor and precision blade for a more precise cut. Can be used for both wet/dry shaves. There is a need to constantly buy replacement batteries since the AA ones are not rechargeable. The blades are too small for thick and coarse hair hence you might take more time to finish shaving. Before buying a travel electric shaver you should have an idea of how you want your perfect shaver to be. There are various shavers from different brands that you can find on the market. Knowing what type of shave you want to achieve is crucial in determining which shaver is best suited for you. In general, a good travel electric shaver should have the following features. The type of blade: The common blade types are a rotary type and foil shavers. The choice of the perfect one depends on your personal preference. However, foil blades are best known for delivering closer shaves thanks to their wide multiple blade shavers. The rotary blades are best known for following the contours of the face to give you better performance. This rotary movement is less irritating and makes these type of shavers best for anyone who has sensitive skin. Travel features: There are small features that matter a lot when it comes to shavers. For some people, a secure sturdy travel pouch can make all the difference. Others might pick size over everything else. I recommend that you don’t go for the later when picking the perfect travel shaver. A good shaver should always have secure locking features so as to protect your items from getting damaged by the dangerous blades. Of course, this will only happen if the shaver accidentally engages hence we cannot completely rule this out. A good shaver should also be cordless. This is one particular aspect that is crucial especially if you are traveling out of a country on you are in an area where you don’t have access to a power source. However, if you don’t carry your shaver with you everywhere that you go, then having a travel cap might not be an important feature for you. Source of Power: Since we are talking about portability, having your device powered by a battery means that you can always carry it anywhere that you want. There are rechargeable and replaceable batteries. The choice will be yours to make. However, I recommend that you always go for a shaver that uses rechargeable batteries. Why do I think so? For starters, the shaver motor is always powerful when using rechargeable batteries. Another feature is rechargeable batteries don’t need constant replacing. All you need is a power source for them to regain their full charge. Most people, however, love the replaceable battery shavers since all you need to do is purchase batteries once the old ones drain out. This is way easier than waiting for a shaver to get a full charge. The obvious advantage of owning a small travel size shaver is that you can easily carry it around. A good travel shaver should be small, lightweight and easy to store in compact spaces. Traveling with electric shavers means that you always have to travel with a power cord or docking in case you run out of charge. There often arises a dilemma whereby you have to decide whether you have to pack a power cord or charging dock. For anyone who travels a lot between different countries, the need to constantly replace the adapter tends to be more costly. Most countries use different power sockets that might not be compatible with your current adapter. Let’s say your adapter is compatible with most power sockets, you now have the trouble of trying to find a free outlet where you can securely charge your electric shaver. The most appropriate solution to this problem is to buy a shaver that uses AA batteries. Replaceable batteries are found in almost all countries. You can easily get a pair from a shopping mall or your local store. You always have a continuous shave even after they run out since the only thing you have to do is to replace them with new ones and continue shaving. This is where the replaceable battery shaver beats the rechargeable one hands down. Imagine a position where you’ve just shaved half of your beard and your rechargeable shaver runs out of power. Are you going to want until it regains a full charge so that you can continue shaving? This is surely a big letdown. All the above travel electric shavers are among the best that you can find on the market. Regardless of the one that you pick you are assured that you will get the best out of it. You should, however, know what you want your ideal shaver to look like. The above shavers have been tailor-made to ensure that all your shaving needs are met. Some incorporate intricate designs to ensure that they perform as expected. My personal preference is buying one that has a rotary head. I pick this type because the head perfectly rests on any contoured face to give that perfect cut and does not leave the skin feeling itchy or irritated. Out of the above three products, the Philips Norelco PQ208/40 will be effective for you. Its floating blades follow your face contour to give you a clean even shave. The fact that it uses 2AA batteries means that you will always have it ready for on-the-go traveling. The self-sharpening feature of this shaver sounds good to the ear and if it actually works then you are assured that your electric shaver is always sharp when needed to. 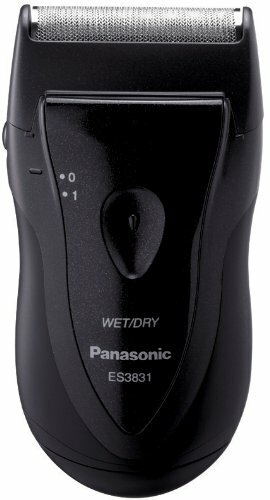 If you are looking for a shaver whose cost will easily fit into your budget, I recommend that you go for the Panasonic ES3831K Electric Travel Shaver. It has a powerful motor and its ergonomic design gives you better hold ensuring that you are always in control. If you are a fashion-driven that wants to look good then these are products that you cannot miss. Make an order for any of the above and you will save cash that could have been spent on purchasing less reliable shavers.